All puppies will be guaranteed to never be affected by ataxia, and also come with a guarantee for hips/elbows as well as cardiac. Show and pet homes are both most welcome to inquire about what we have available or planned breedings. ​Serious inquiries may be directed to us via the Contact page. CLICK HERE TO VIEW JED AND BLUEBELL'S PUPPIES! We will not hold any puppy without a deposit, which is half down on the particular puppy you are wanting. 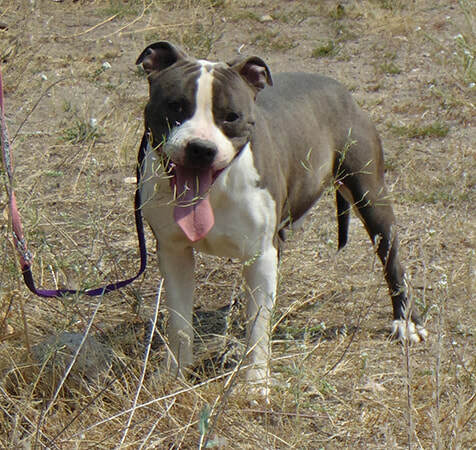 Limited vs. Full Registration: All of our American Staffordshire Terriers are sold with limited AKC registration papers (companions/pets), unless you specify that you would like the option to breed or show in conformation (Full Registration). They are still AKC registered (and you can obtain a certified pedigree and a registration certificate from the AKC proving they are pure-bred) if they are on a limited registration, their offspring just cannot be registered with the AKC. AKC papers will be provided before the puppy reaches 6 months of age so the new owner can transfer ownership and permanently register their new puppy with the American Kennel Club. If acquiring Full Registration status on your American Staffordshire Terrier puppy, please understand that we only want to ensure the “best of the best” AmStaff puppies are selected from our litter to influence the AmStaff breed. We require a written contract for full registration status, ensuring that any AmStaff bred is being bred to the same standards that we breed. Companion/pet quality puppies should not reproduce, however, this does not mean you are getting a lower quality AmStaff puppy simply because they are sold with limited AKC registration papers as a companion/pet and not a show prospect/breeding prospect. All of our American Staffordshire Terrier puppies mature into beautiful specimens of the breed, and it is actually fairly difficult for someone to be able to tell the difference between a companion/pet puppy and a show prospect puppy from us because our American Staffordshire Terriers produce such consistency within their litters. We hold our breeding program to a higher standard than most, therefore, you will find we also hold our new AmStaff puppy owners to a higher standard. Please be prepared to care for your new puppy to your best ability with high-quality diet (We prefer to feed grain-free Taste Of The Wild), and provide the best environment, training and socialization possible for your puppy to thrive and live a long, healthy life. 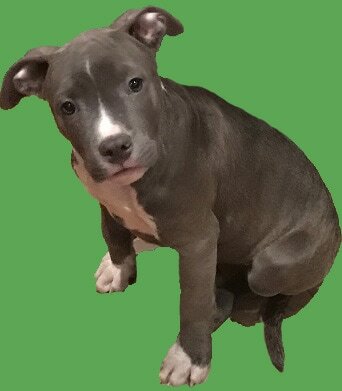 Reservations: Because our AmStaff puppies are in great demand (especially any blue puppies specifically), most have deposits on them and are spoken for well before they are born or soon after. It is wise to reserve early after reviewing all of our kennel information and data on each particular litter. You may request pictures via e-mail of the parents of each litter, and the puppies. You may choose a litter, and color preference (we cannot and will not GUARANTEE color) and gender of the pup. We require a non-refundable deposit of half the cost of the puppy when your reservation is placed (no personal checks will be accepted, but we accept certified cashiers checks, bank transfer, wire transfer, or a money order issued from your local post office) and the balance is not due until the puppy is 1 month old (including any flight, crate and health certificate costs if you are not picking your puppy up in person from us). We schedule people to pick up (or ship via airline or ground) their puppy at 8 weeks old in the order in which their deposit was received. Please contact us for pricing on the particular litter you are interested in. Our “companion/pet puppies" may be priced slightly different than our “show/breeding prospect puppies”. Any puppy deemed as a show prospect may possibly be placed into a pet/companion home without any requirements to show, however; the show prospect price of $1500 will not be reduced even if the puppy will never be shown and/or bred by the new owner. Once your reservation is placed, you will also receive emails including pictures of the litter every 2-3 weeks as they grow and change, so that you don’t miss out on this wonderful time. We take pictures of each individual puppy from the front, both sides and include a headshot and if possible, a short video clip. *NOTE: Since our puppies cannot receive their first DHLPP (Distemper/Hepatitis/Leptospirosis/Parvovirus/Parainfluenza) vaccine until 6 weeks old (and a second vaccine again at 8 weeks old) we do not under any circumstances ever allow anyone to visit our puppies until at least 8 weeks of age when the second DHLPP vaccine has been given to protect our puppies from disease. At Aesir we believe health and temperament are the most important ingredient in our breeding program. 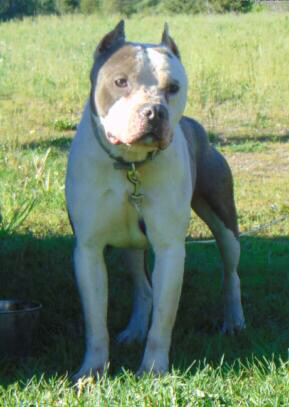 In addition, we select American Staffordshire Terriers that have correct conformation (their physical structure and movement or "gait") and strive for high-moderate drive with good working ability. Our puppies are healthy, loving, beautiful and intelligent. Puppies destined for competition are selected first based on the specific needs for the sport. Our price includes a puppy package that has your pup's vaccine & de-worming record, the parent’s health information, pedigree information, AKC registration application and a life-time health guarantee. We support each family who is chosen for one of our puppies and let them know they are now a part of our extended family. We will always be available to answer any questions that you may have about your puppy from us. As well as a lifetime of support from a breeder with over 16 years of experience. When the puppy is ready to be picked up he/she will have had his/her first two sets of puppy vaccinations and thorough health examination by a Veterinarian (health certificate included only on puppies that are shipped via airline) and he/she will also have been wormed multiple times at 2, 4, 6 and 8 weeks of age. Your puppy from us will be extensively socialized with small children and other dogs/pets from birth, in our home, and will have been exposed to various sights, sounds, and smells. We do use the bio-sensor method on our puppies from birth. They are strictly fed a high-quality, grain free diet of ﻿Taste Of The Wild﻿. By the time our puppies are 8 weeks old and ready to become part of a new home they have been evaluated to ensure that their temperaments will be suitable for the families they will join. Shipping via airline can be arranged but we do not ship puppies that are less than 8 weeks old. While not absolutely required, we prefer that new owners pick up their puppies in person. Shipping costs are the responsibility of the purchaser and are not refundable, the cost will be $450 to ship your puppy via airline and this cost also includes the airlines fuel charges, tax, airline approved shipping crate (with attachable feed/water dish), and a valid health certificate from a licensed Veterinary (required by law).